There are many gifts of the season. But I have a gift of a lifetime—my children. As I type this, my two little ones are napping on either side of me. Their sweet, slow breathing is mixing with the soft music coming from my laptop, and I thought it would be nice to offer something to my readers. It's been a while since I've done a Pantone Colorstrology poster. 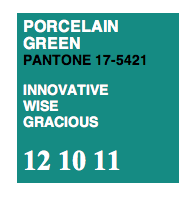 And today's color is Porcelain Green: Innovative, Wise, Gracious. Wonderful qualities to cultivate! Especially during the holidays. 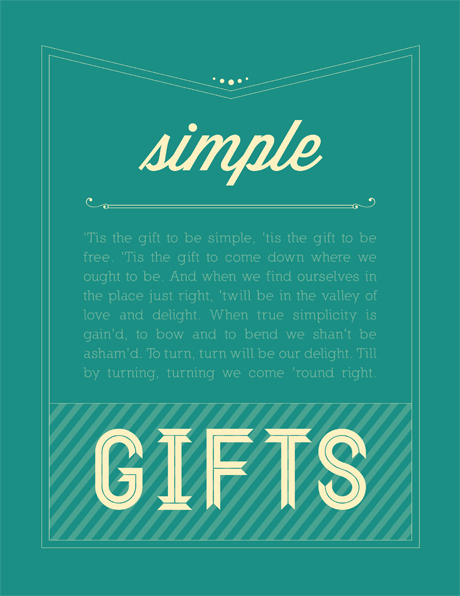 Listening to David Tolk's version of the song Simple Gifts gave me the inspiration for this little holiday download. Just click the link below to download the 8.5x11 design. Then print it out to use in your home or digital designs. (You could also convert the PDF to a jpeg and upload to Vista Print if you ever wanted the poster professionally printed, as well.) Happy Holidays! What are your favorite gifts in life right now? Design © Lyndsay Johnson. Personal use only. May not be reproduced for profit. I love love love that song!! Love it. It's just what I needed.